Cindy has spent her life in the pursuit of creative fulfillment. Cindy studied art at the University of Alabama in Huntsville and began a career in graphic design in 1979. In her mid-thirties, she also became an archaeologist earning a degree in Anthropology from the University of Colorado in Boulder. Art and Archaeology have been the leading influences in Cindy's life and they have heavily shaped her creative path. Her jewelry designs are an amalgamation of both of these influences. Always looking for new creative outlets, Cindy enrolled in a silversmith class while living in Colorado and began applying her skills to jewelry design. Traditional silver work soon lead to the discovery of Precious Metal Clay (PMC) which quickly became Cindy's medium of choice. 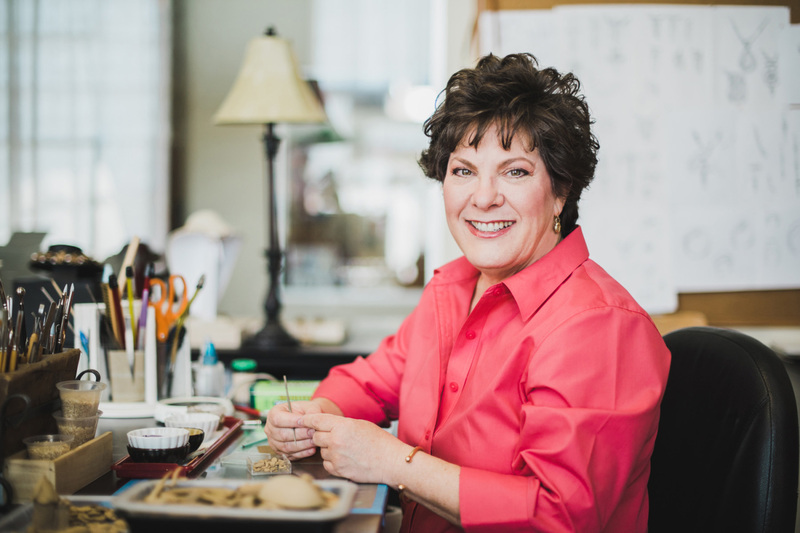 Cindy has been working with metal clay since 2004 and received her PMC certification in 2008. As part of the Metal Clay Master's Registry she has earned a rating of Maters Level II. In May of 2017 Cindy was awarded the Saul Bell Award for Metal Clay. The Saul Bell Award has become one of the most sought after design awards for jewelers and metalsmiths worldwide. Click here for the Cre8tive Fire Magazine Artist Profile. I sculpt metal clay wet to achieve fluid designs and then dry them flat or on curved surfaces to create a variety of forms. Once dry, I use wood carving tools and craft knives to refine the shape or carve designs on the pieces. I also create textures by carving, or embossing a variety of materials that can be used to impress textures into the metal clay. Hollow forms are assembled from several pieces using slip made from the metal clay. I sand the dried clay to a smooth surface and place in the kiln to fire. Once the pieces are fired, I add color with colored pencils on the rough unpolished surface of the bronze or silver clay then seal the surface with acrylic. I then polish the areas of the metal that I want to highlight. I sand by hand and use magnetic and rotary tumblers depending on the finish I want to achieve. Sometimes I use traditional metal working techniques to attach found objects and I cut and polish many of the stones I use in my designs. September 2015 - 2nd Overall, Riverclay Arts festival in Decatur, Alabama. Metal Clay ArtistMagazine Vol. 2 Issue 3, Expert Advice column, Article: Collagraphic Texture Sheets, In the News column, one of the featured artist in the coverage of the New Directions exhibition. Cindy has been featured in galleries, and retail shops across the country including Alabama, Arizona, Colorado, Idaho, Tennessee, Texas, Virginia, Washington DC.